This section excludes the main body shell and other panels that are pinned to the wood frame. 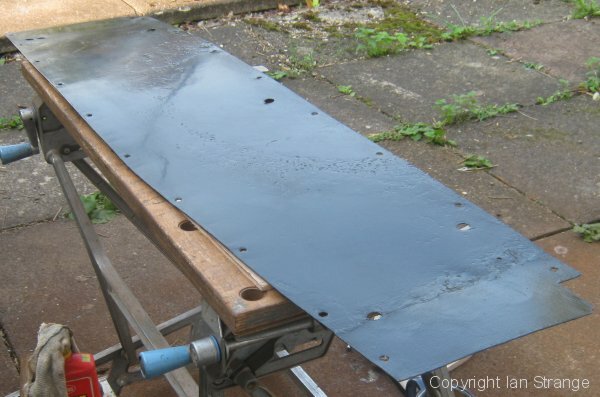 Many of the inner panels are made from mild steel, and are likely to require repair or replacement. 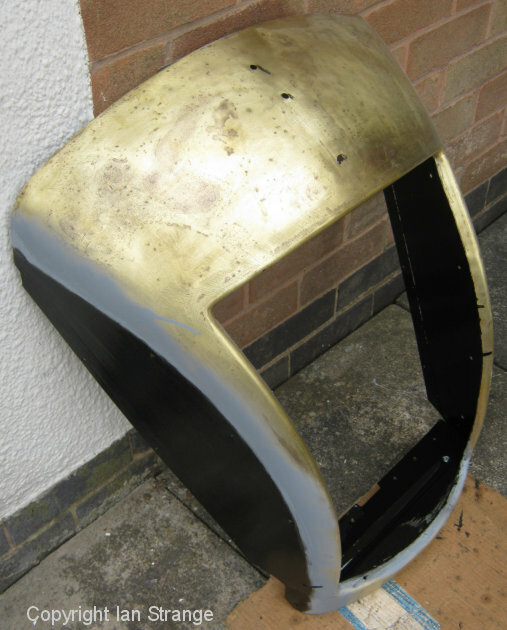 The spare wheel compartment features a side panel made from a single sheet of steel, bent almost into a U-shape. Its upper edge is folded over as a reinforcement. 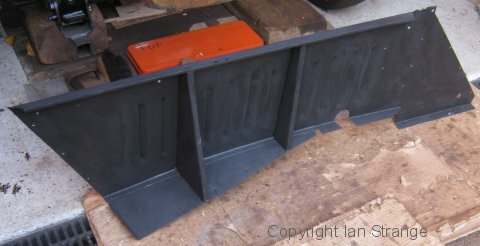 At the bottom, it has a series of flanges so that it can be bolted to the chassis underpan and the small floor panel. There are cut-outs to clear the spring shackle bolts and access holes for the spring bolts. There is also a steel floor panel that bridges the gap between the chassis rear cross-member and the rear cross-member of the wood frame. 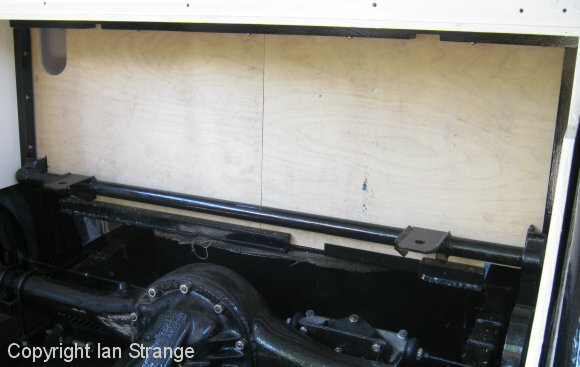 There is a wooden batten bolted to the chassis to allow that floor panel to be screwed down. The screwheads need to be as flush as possible to allow the spare wheel to slide in without damage. 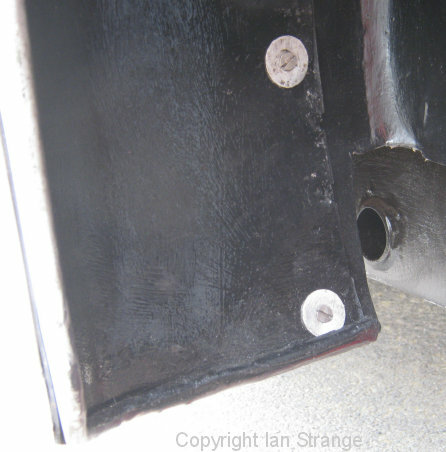 Originally, there were slight gaps between the ends of this panel and the plywood boot side panels, allowing road spray and dirt to pass through. I stuck some self-adhesive foam neoprene (left over from other parts of the car) to seal those gaps. The floor has some drainage holes plus an additional hole towards the left end, close to where it meets the side panel. This is for the wiring to pass through, with a suitable rubber grommet. The rusting away of these inner wings, speeds up the deterioration of the wood frame. Their design also acts as a water and dirt trap. Most of the lower edge is folded into a channel around the edge of the plywood boot side panel. Therefore, I did away with this folded edge, left the edge of the ply exposed, and added some extra woodscrews. The plywood had already had its edges sealed with water-proof adhesive and then painted over. 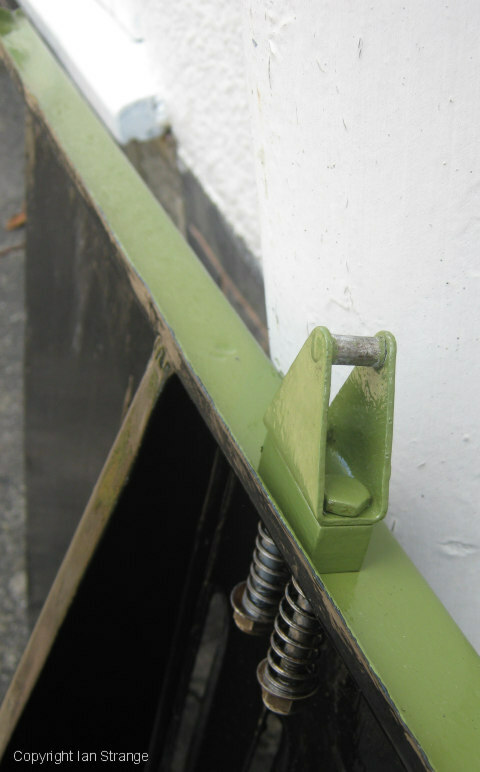 To secure the inner wing to the plywood, I added some no.8 woodscrews with thick washers so that the thread would hold. This change also makes it much easier to install the inner wing, since the brake backplate normally gets in the way. 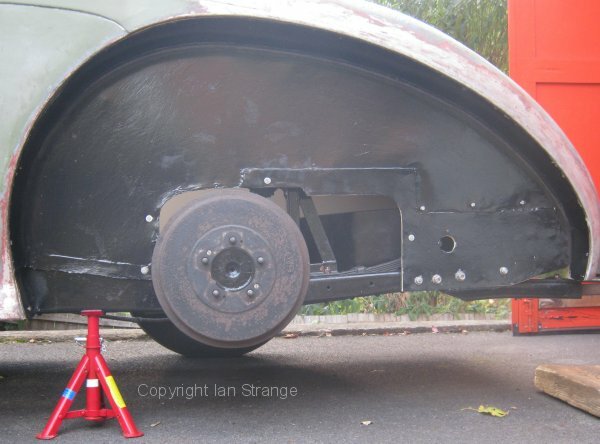 One other minor change was to the way I fixed it to the wooden wheel-arch. Orginally it was held by a large number of 3/4" nails. 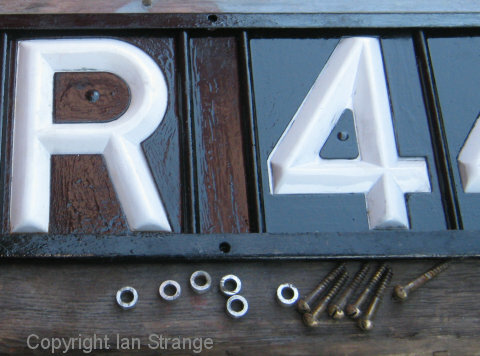 I used no.4 x 3/4" stainless steel woodscrews, in slightly smaller numbers. With these two changes, it will be much easier to remove these inner wings again should the need arise to make repairs to the wood or the panels. If you need to make new replacements or extensive repairs, most of the dimensions you need can be taken from the wood frame. The photos here will show you what the finished article looks like, remembering that later ACs had a slightly different cut-out for the back axle. The extended cut-out as shown here, is to accommodate the lever-arm rear damper. For repairs to mine, I used a heavier gauge than the very thin original, increasing from 0.7mm to 1.1mm. If, like mine, your AC had lever-arm dampers removed, that leaves a large gap where water and dirt can wreak havoc inside the rear of the car. It is a good plan to make and fit a panel to close that gap. A detachable section will allow easy access during maintenance or repair. Additional details to note include bolt-holes for the boot floor support batten. On the left-hand inner wing, the earth-wire for the rear lights is attached with a wood screw. This is a simple 1/4" (6mm) thick plywood panel, screwed to the various wooden battens. Mine had been cut in two, probably by AC when they upgraded my rear dampers and this makes it much easier to remove. So I made my new one in two parts. I also increased the thickness to 9mm, because I could not find suitable quality ply in 6mm, and it probably adds a little extra strength to the part of the body which lacks any bulkhead. You might want to consider making an access hatch for the fuel pipe? 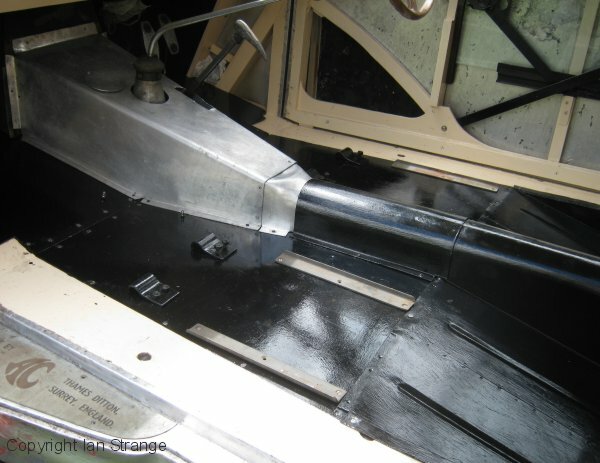 Sheet aluminium is used for the panel under the rear seat, and also for the cover over the gearbox. 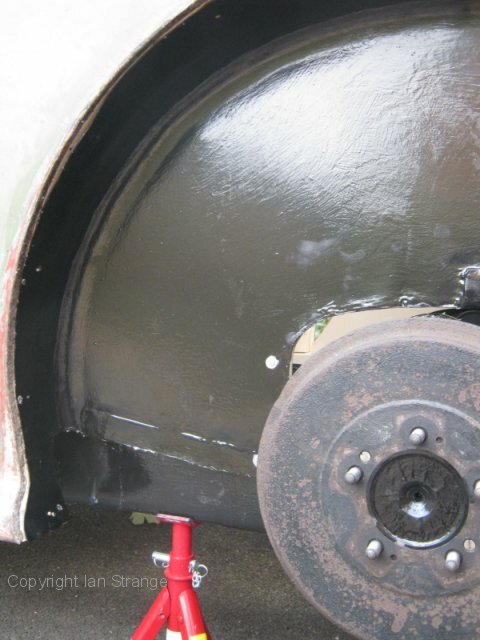 Steel is used for the rear floor panel and so whatever paint system you prefer needs to be done as meticulously as the rest of the painted steelwork on the car. The other floor panels are plywood, 9mm thick, but only mediocre quality 5 ply material on my AC. 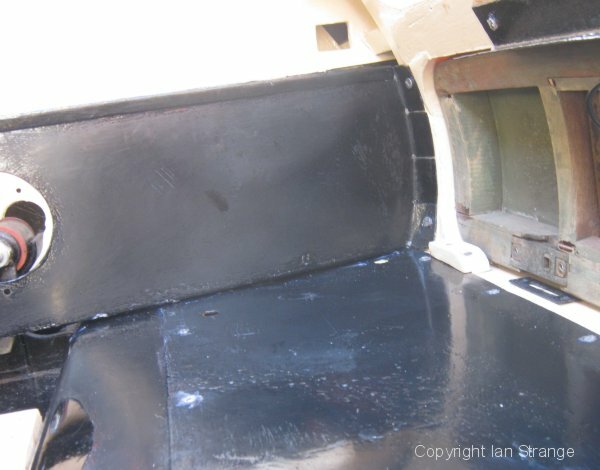 Both steel and wood floor parts were coated in the usual bitumen. I painted the wood with aluminium-based primer and 1-part polyurethane. 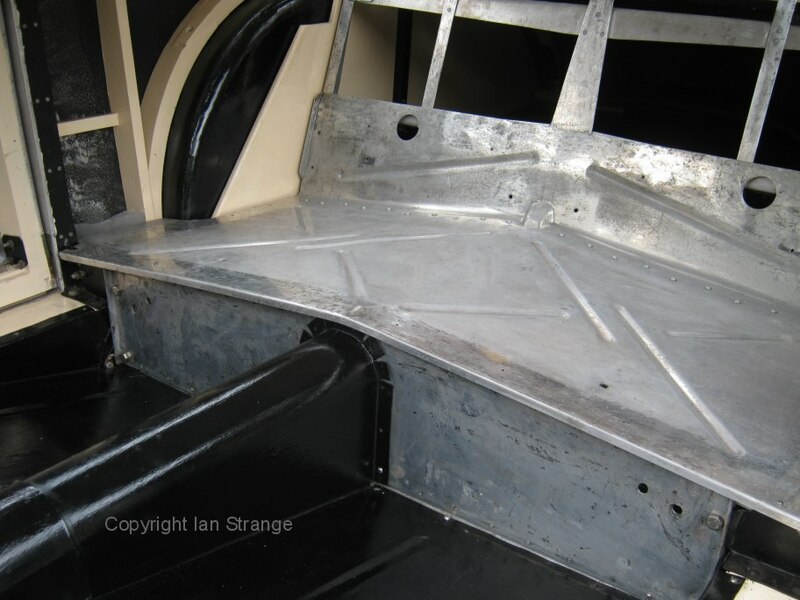 The front floor panels are attached to the main panels with 2BA countersunk screws and corresponding anchor nuts rivetted to aluminium strips under the floor. The strips are bolted to the main floor panels with the same no.10 UNC screws used extensively on the AC. 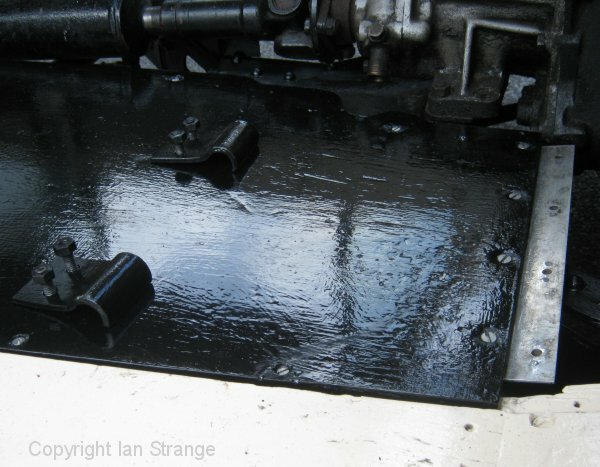 Above are the front floor panels viewed from underneath, after removing the bitumen coating. 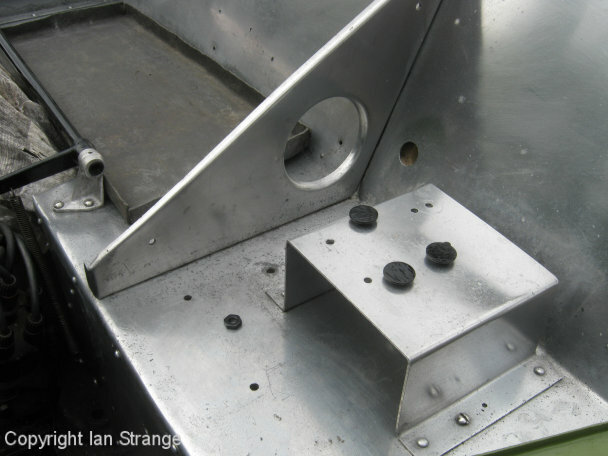 Above, you can see the brackets for securing the front seat, and the aluminium strip with 2BA anchor nuts rivetted unerneath. An aluminium cross-member helps to support the floor and rear seat. This part is fabricated from several parts held by aluminium rivets. 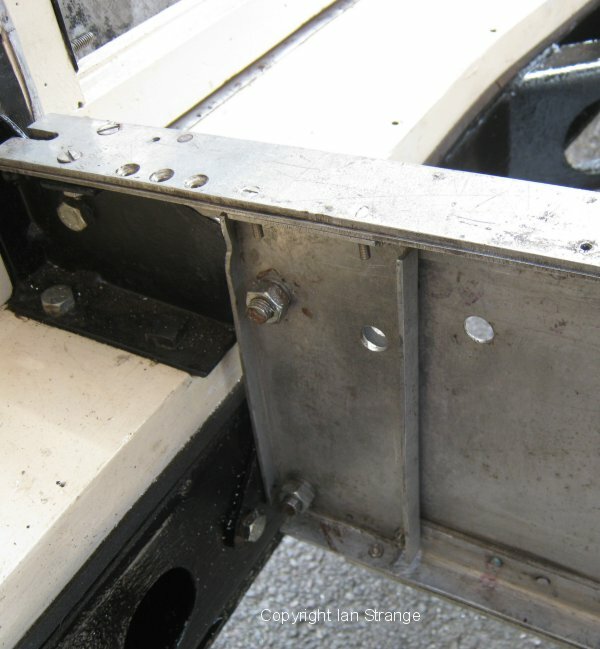 It is attached to the chassis by small steel brackets and also to the brackets on the hinge pillars. 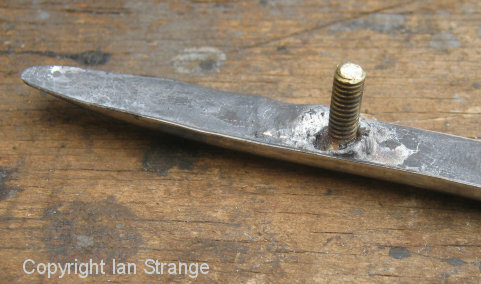 Unfortunately, it is only possible to remove by drilling out some of the rivets at one end, to remove a small section. I refitted it held by brass BA screws and nuts for easier removal in the future. The aluminium frame that supports the rear seat (and fuel tank) is bolted together with no.10 UNC screws and nuts. 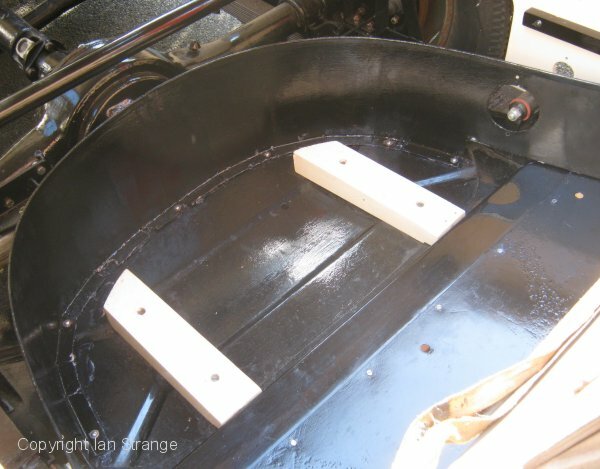 It is held very firmly with woodscrews to the rear shelf framework, but only a single small screw holds each bottom corner to the main sillboards, reinforced by a small steel plate. This had fallen off on one side of my AC. I strengthened these joints by using 2 woodscrews each side, and increasing to no.10 gauge. I plan to add seatbelt anchorage points, so building up the strength was essential. The main weakness of the bulkhead is where the battery sits. Although there is a lead tray under the battery, it is not big enough to protect the aluminium from acid splashes. After holes appear, rain water might get through and destroy some of the sound/heat proofing inside the bulkhead. 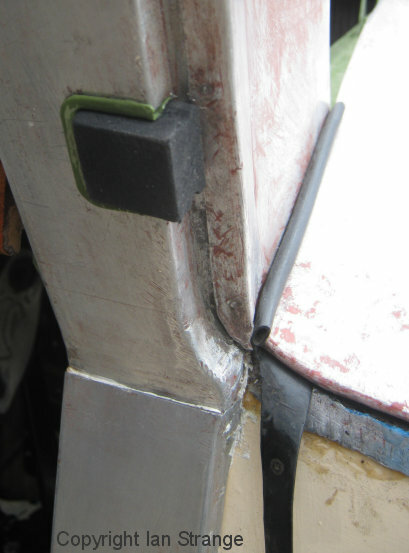 At least repairs should be straight-forward, either welding or gluing repair sections in. Most of the damage is hidden from view anyway. It is then advisable to add some protective material to protect it from further damage. These are made from steel, but a heavier gauge than the rear ones. AC's from about mid 1948 onwards, have louvres cut into them. They are bolted to the chassis with 4 no.10 UNC round-head machine screws, into threaded holes. 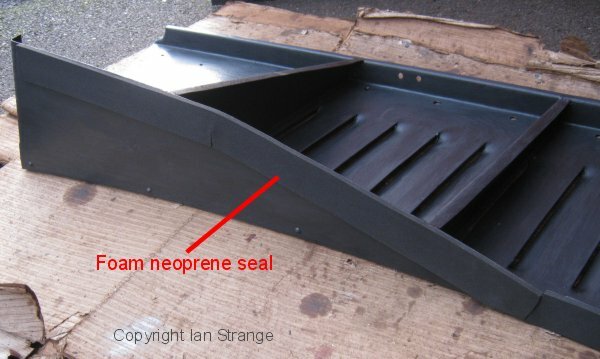 There is a rubber seal between the panel and the chassis. 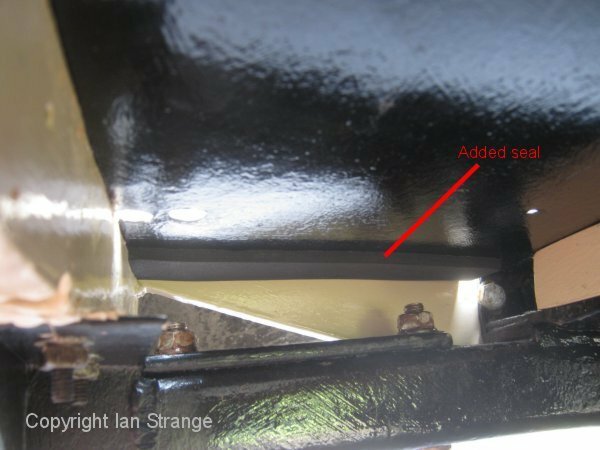 Originally, the seals were solid rubber (1/8" or 3mm thick), but these failed to keep out water along this uneven stretch of chassis. Therefore, I fitted self-adhesive foam neoprene, 5mm thick. Don't panic if you have trouble reassembling the front body panels and getting bolt holes to line up. Flexing of the radiator on is rubber mounts, and the inner wings on their rubber seals, plus flexing of the panels themselves, allows plenty of adjustment until it goes together. 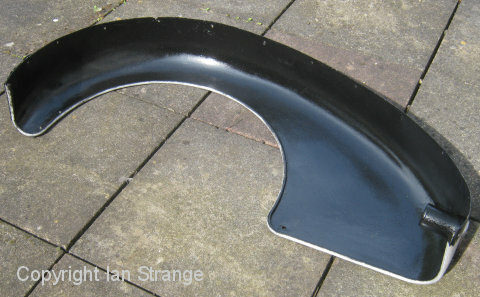 The bonnet catch and the top shelf of the inner wing, are painted in bodywork colour. I applied some shiny Tekaloid black paint to the engine side of each inner wing, while the outer sides received 2 part PU for protection. Primer on both sides was Jotun epoxy-mastic. These use a heavier gauge alloy than the rest of the outer bodywork, at 16 gauge (1.6mm). This combined with the compound curves gives them sufficient stiffness and strength, reinforced at the lower edges with steel rod beading. Yes, I did say "steel"! For that reason, I run oil or Waxoyl into the beading. The front wings might have cracked where the bumper irons press against them, and also near the larger mounting bolts. 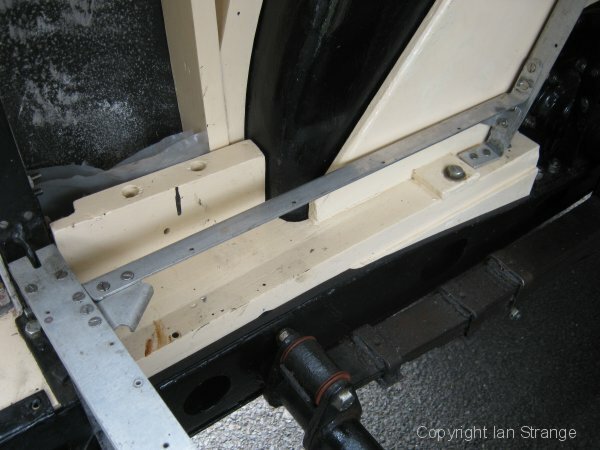 Some form of reinforcement along those upper bolt areas would safe-guard against damage by anyone leaning against or sitting on the front wings. I made some large square washers from thick aluminium sheet, to use on the main mounting bolts. 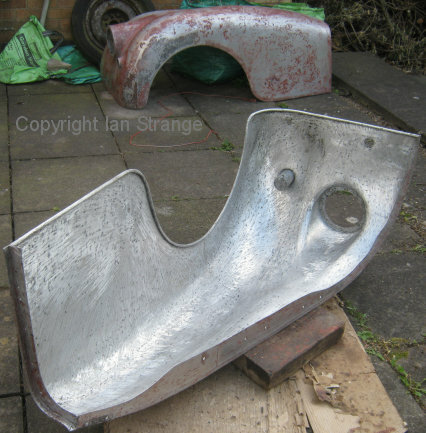 The rear wings will probably have corroded where they are in contact with the steel inner wings. 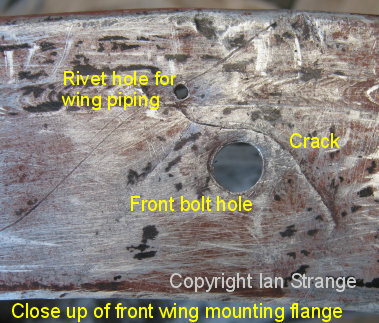 Corrosion damage might also occur around the coachbolts on the wing-stays and the front end of the front stone-guards. Make sure that the new bolts and the brackets are separated from the alloy with rubber or sealant, or maybe some other synthetic washers. The rear wings are fixed on with no.12 x 1.25" countersunk woodscrews with thick gauge aluminium penny washers. These washers are omitted from the 4 screws (each side) that hold the wire-mesh stone-guards on. 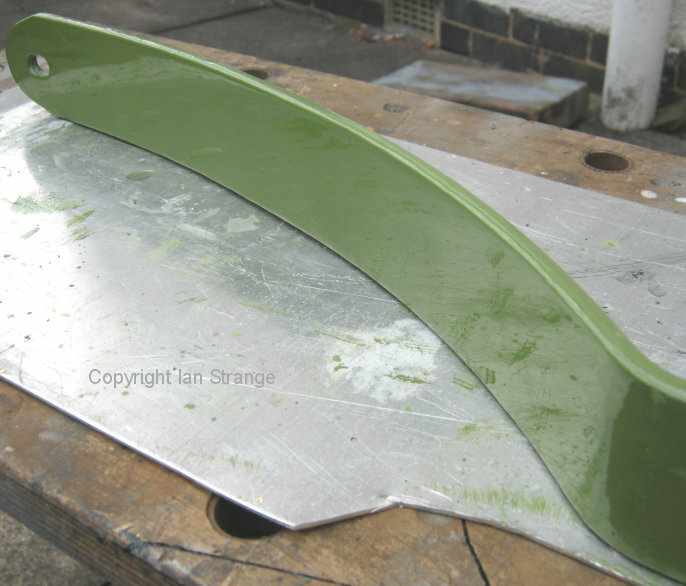 I painted the insides of the wings with Jotun epoxy-mastic and top-coated with 2 part polyurethane. This seems to stick extremely well and after weeks/months of curing, becomes extremely tough. 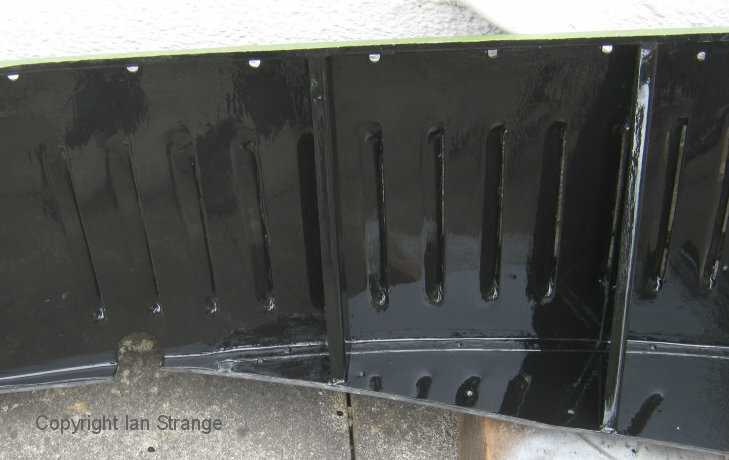 As usual with the AC, bitumen was the original internal coating. Some restored ACs have the rear wings fitted too far into the bodyshell. Archive photos show that this is something that did not vary. The overall width of the car across the tops of the rear wings, is 1692mm (5 feet 6.6 inches). Measuring from the flat surface of the inner wing, the top of the wheel arch (outer surface) is 276mm (10.9 inches) away. The most forward point of the wheel arch, is 269mm (10.6 inches) from the inner wing, again measured to the outside of the wing. These sheets of rubber help to prevent stones thrown up by the front wheels from damaging paint on the rear wings. The outer edge of the rubber is clamped onto the wing by stainless steel trim, filled with solder which holds a pair of brass 4BA screws. Unfortunately steel nuts were used and the brass screws might break on removal. Soldering new screws on is a fun challenge! I tried making an aluminium template to fix the 2 screws to, while dipping them into the solder, but the aluminium absorbed too much heat (so the solder didn't stick to the screws). Maybe a wooden template might have worked? I then used pliers to place each screw into the solder, being careful to get the position just right. Many of those trim pieces have been lost from ACs, or else have had screw-holes drilled through them as an easier fix. Above is the stainless steel trim and one of the screws embedded in solder. 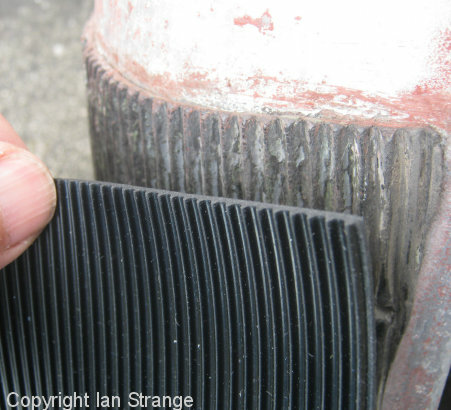 Photo below shows original and new rubber. The rubber sheet is ribbed with a fine pitch. Sticking it onto the wing presents a problem, because its edges will wrinkle up on the wing's compound curvature. The stainless trim will clamp one edge down, then I stuck most of the rubber with a non-setting rubber sealant. Finally, I epoxy glued (quick setting) the edges, compressing the rubber by hand and a set of small clamps. My clamps couldn't reach all areas, so I improvised when getting the last few stubborn wrinkles flattened out. Note that the rubber matting extends into the wing/body join. Along that hidden edge, I cut a couple of triangular sections out, to reduce the tendency to crease. A new use for an adze! Improvising, to clamp down and glue the last crease. The PVC wing piping tends to shrink, especially when left unpainted, since this exposes it to ultraviolet light. On mine, there was enough extra material tucked under the bodywork out of sight, so that I could unfold it and compensate for the shrinkage. 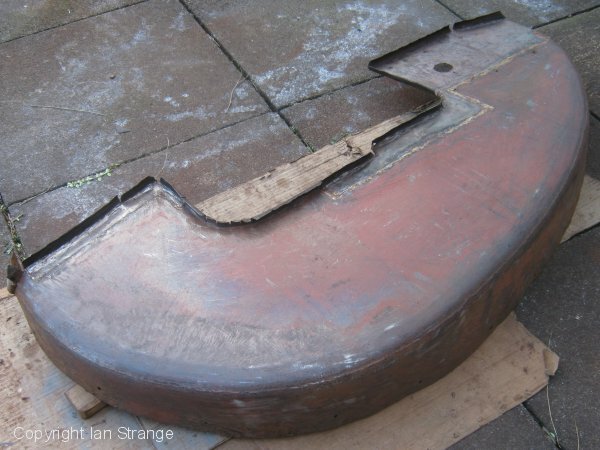 The wing piping for the rear wings was originally tacked to the wood frame wheel-arch. I used small (no.4 x 0.75") stainless steel woodscrews instead. 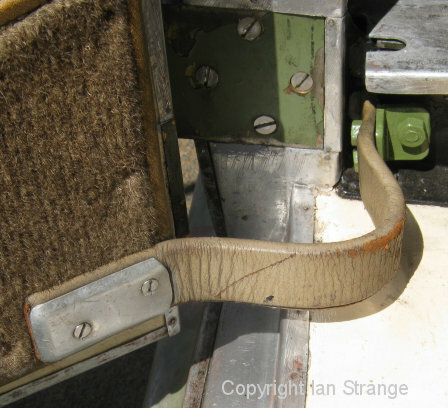 The piping between the front wings and radiator cowl originally had a small rivet at its top end holding it to the wing. For now, I've omitted this since the piping is tightly clamped by the body panels, and will wait and see if it stays in place after some motoring. All of this piping is of the hollow type, 6mm (0.25 inch) diameter with a 25mm (1 inch) flap. Flap thickness of 0.7mm is much thinner than new piping on the market at the time of writing (2018). 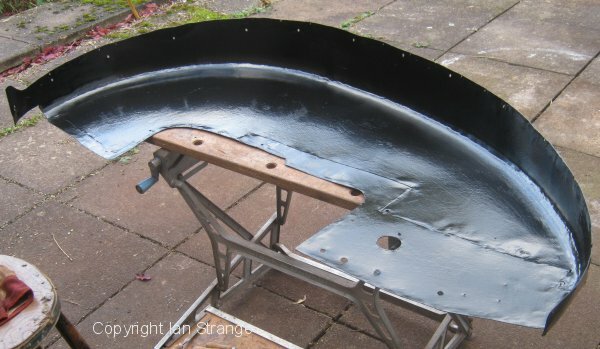 I sanded the shiny surface off mine in readiness for painting, which I hope will prevent further shrinkage, as well as following AC's original practice. Above you can see wing piping in place. The tail end was originally tacked to the plywood, but to avoid promoting rot, I let the panel-cover clamp it, which should be sufficient. 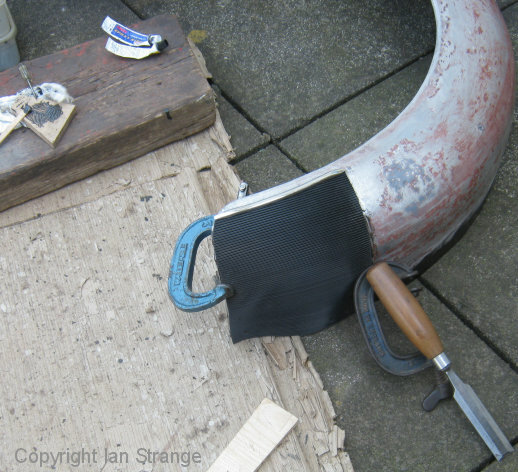 You can also see a new (home made) door-stop rubber in its repainted steel holder. These are fixed onto the back of each front wing with a pair of concealed coach-bolts and wing-nuts. They are made from 9mm thick plywood, covered on one side with alloy panelling, wrapped around the edges of the wood. 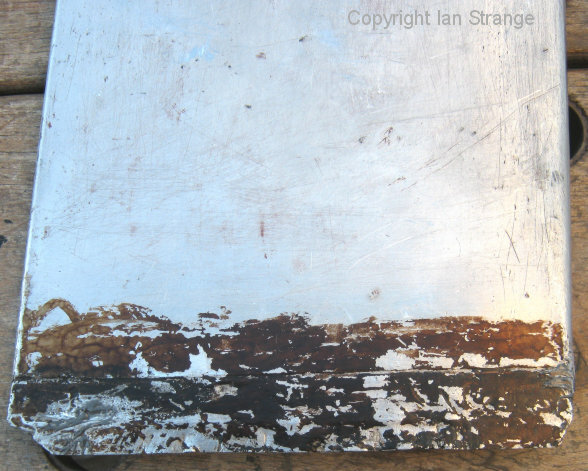 To fit new plywood, you will need to anneal the alloy along the lower edge and flatten out the metal. I used plain soap spread over the surface, and then heated with a blow-torch (or over a stove) until the soap turned black. My right-hand panel's lower edge was not parallel with the door-step, when installed, so I took the opportunity to improve the fit. In the photo below, you can see the original fold-line, now that the panel has been altered to fit. The two layers of plywood at the back of each front wing, are exposed to road spray, and are usually the first wooden parts to rot. 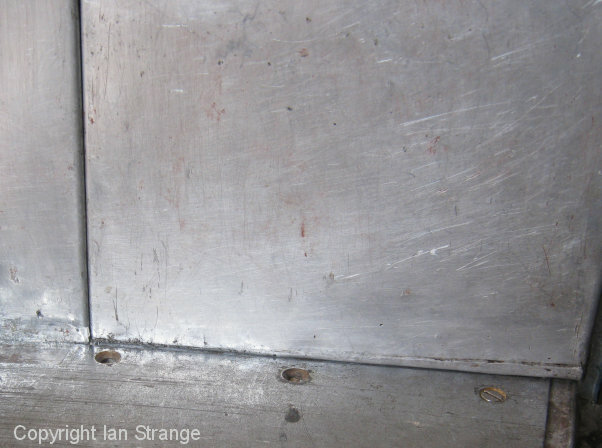 Therefore, I made an additional aluminium panel to bolt onto the hidden side of the access hole. I stuck foam neoprene seals onto it to make it water-tight. Interestingly, these are made from brass, although the first few ACs were built with aluminium-alloy cowls. The only likely challenge with these is to get paint to stick, including the internal black paint. The most popular approach is to be scrupulously clean and to apply self-etching primer. 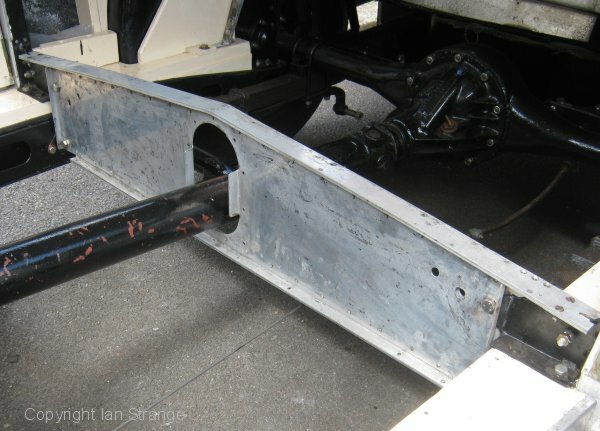 Bumpers are bolted to the irons with coach-bolts (cup-square) and hex nuts, and not the more familiar "bumper bolts" used on more modern classics. My bolts were a mix of BSW and BSF thread, chrome plated, 3/8 dia. by 1 inch long. The bumper irons and associated bolts are painted in bodywork colour. This is a handy chance to practice one's painting skills prior to tackling the body. In my case, I coach painted these items including a clear coat on top. Painting both sides of any such brackets, presents problems, especially when as heavy as these ones. Painting one side at a time, and turning over after 2 or 3 days, will spoil the dry paint, which is still soft enough to embed dust, or get scratched. Standing these irons on edge, makes it harder to lay-off the brush strokes. Eventually, I laid the irons flat, resting them on the areas that will be hidden after assembly. Having a horizontal surface to paint, allows you to flood it, which then levels better than on a vertical surface, and without so many runs. The basic painting process, for coach painting, is as follows: Etch primer, or possibly epoxy-mastic for steel at risk of rusting. If using the epoxy, be very careful not to breath in dust from sanding, and it is best to leave for several days to properly cure and then sand. No sanding needed for the etch primer. 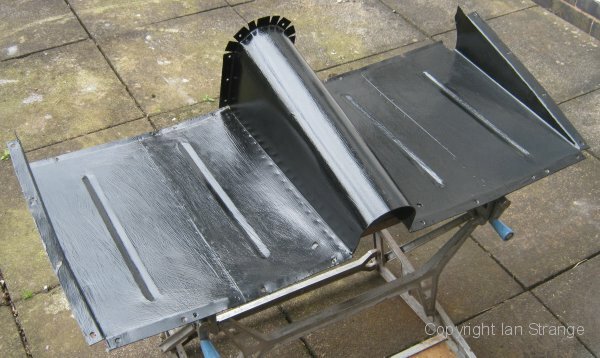 Then build up 2 or 3 coats of Tekaloid/Tractol undercoat and leave for at least 2 days before a thorough sanding to a perfectly smooth finish. 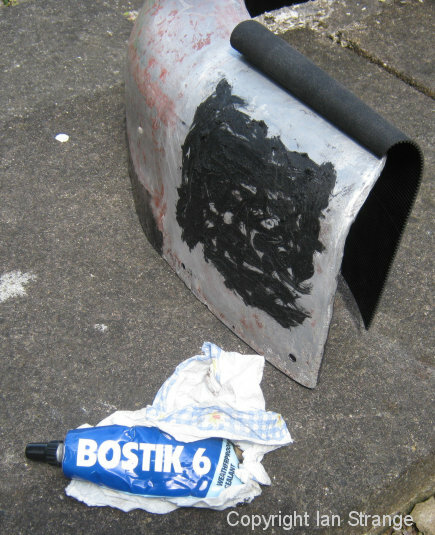 Then 2 or 3 coats of Tekaloid in the required bodywork colour (at least 2 days between coats). Be sure to mix the paint thoroughly, but not too fast, to avoid bubbles. Also, brush fairly slowly to avoid creating more bubbles. Hot weather can stop any bubbles from properly surfacing, and will leave tiny dots in the finish. Gently lay off the surface with the brush, being progressively more gentle with each brush stroke. Be sure to use the best quality brush for the top coats. I use Hamilton's hog hair brushes. The day after applying a top coat, check for any runs and carefully slice them off with a sharp knife. Leave to dry for another 2 or 3 days before rubbing smooth with wet and dry paper (wet). I usually start with 320 grade and work up to 600. I also sometimes sand it without water, on surfaces where there's a high risk of going through to bare metal, as it is easier to see when it is dry. Finally, a clear coat which will level even better than the coloured paint. You might need to get some paint filters (or old hosiery!) to remove any solid bits of paint that spoil the finish. 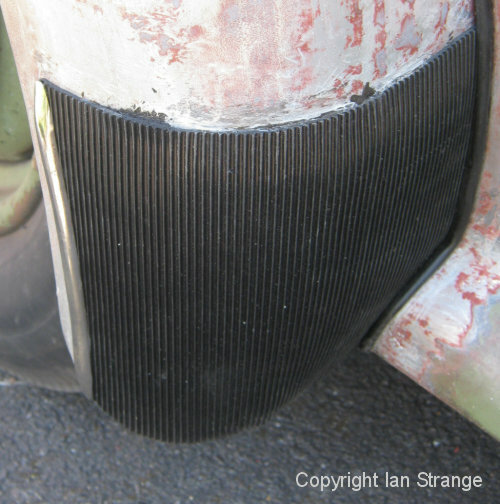 It is not unusual to find ACs with their front and rear bumpers at the wrong ends of the car. The rear bumper has a tighter bend at each end. 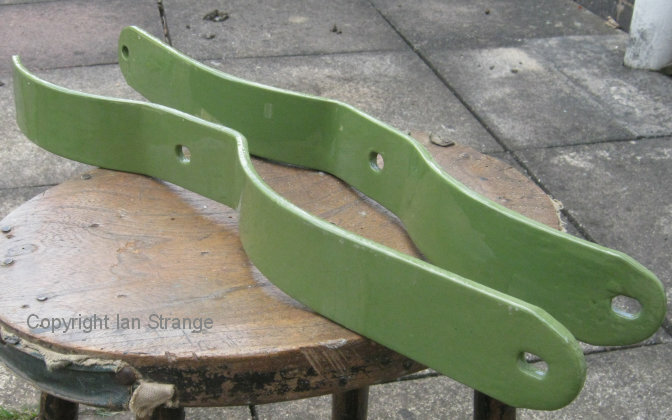 The original style of front number-plate (for UK cars) was mounted on a pair of brackets painted bodywork colour. The plastic (polystyrene?) figures were fixed with special washers. The rear number-plate was backlit, featuring white Bakelite figures. Each figure was partially wrapped in sheet metal (2 of mine were steel, and the others aluminium) which were painted black. To avoid breaking the Bakelite, I repainted the black metal without dismantling. If one accidentally stains the Bakelite (as I did! ), it can be cleaned with bleach. The above view shows rear number-plate digits mounted in their frame. and the pieces of aluminium tubing are spacers that go under the perspex. 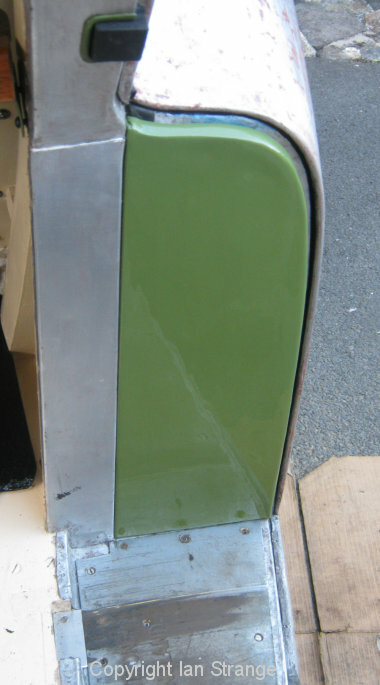 Various other fittings were originally painted to match the body colour, including the boot-lid stay brackets and assemblies, the angle brackets for the front shelf, and the brackets and fasteners for the leather strap that limits door opening. 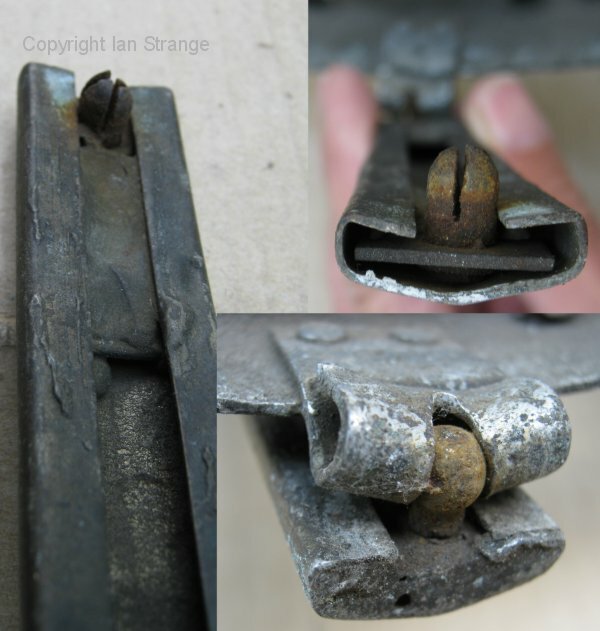 After the front hinge bracket breaks (as they nearly always do! ), the bonnet louvres tend to get dented. The bonnet is made slightly flatter than the curvature of the scuttle, so that it fastens down firmly. Made from chrome-plated brass, the fixings varied during the production years of this AC model. 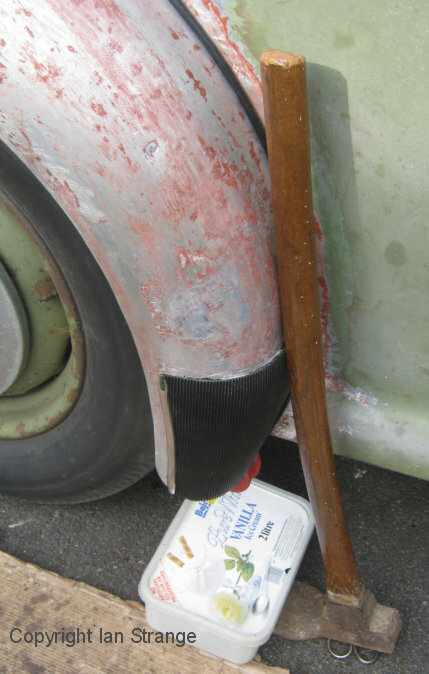 The windscreen and fixed side windows on my 1949 car, featured little angle brackets, screwed and soldered on. Unfortunately these were made from sheet strips bent over, which makes them prone to cracking and breaking. It might be better to make new ones out of rolled brass angle-girder, although the angle of some brackets is not quite 90 degrees. They need to allow clearance for the varnished wood trim. The rearmost brackets on my side windows had never been installed from new. I think they broke, and someone did not bother to replace them! The cut-out in the wood frame on one side was never made, which is why I'm sure of this. It will be different for later ACs with opening side windows. The mascot is held by 3 bolts. These only need to be slackened for the mascot to slide on or off, and fine adjustments can be made to align it with the radiator grill. The mascot is hollow, so any damage might need to be punched out from inside. At its upper end, it is fixed to the radiator cowl with a pair of 4BA round-head brass screws. 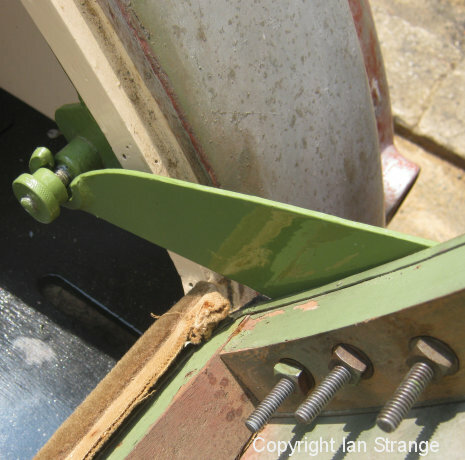 These screw into floating anchor-nuts, rivetted to the cowl. These allow fine adjustment to fit the grill. The bottom end is fixed with 4BA screws and full nuts. The pivotted section (for starting-handle access) is often damaged or lost. It is attached with a steel ball joint, and a steel 4-way split-pin. Both may have rusted beyond repair. For information on mechanical maintenance, see the "Maintenance" section. For useful reference photos to assist restorers, visit the Restorers' Gallery.